To Chris Matthews, whose bellowing style tends to trample his guests, the new forum is like moving from a barroom to a high-toned brunch. On his year-old Sunday morning show, he reins in the "Hardball" hyperactivity and actually lets other people finish a sentence or two. "My job on Sunday is not to grill people," he says. The chat show, syndicated by NBC, has been a surprising success. While "Hardball" ratings are scraping the cellar on MSNBC, "The Chris Matthews Show" is drawing 2.1 million viewers, beating "Fox News Sunday" nationally and even edging out CBS's "Face the Nation" and ABC's "This Week" in Washington and New York. The marching orders were provided by NBC News President Neal Shapiro, who wanted a slower pace, telling the mile-a-minute Matthews: "You're going to do it my way." Matthews recognizes that his bulldozer approach and fleeting attention span turns some people off. "I'm working on that overall. I'm interrupting you right now," he admits. "It is so hard to get that right." Darrell Hammond, who does a dead-on Matthews on "Saturday Night Live," says that "we play him ready to pounce, staying low as if he's getting ready to jump across the desk, just shy of a coiled spring. He's a guy you'd like to have at the Department of Motor Vehicles, telling people off." But under the firm hand of former "Meet the Press" producer Nancy Nathan, the Sunday show is different. 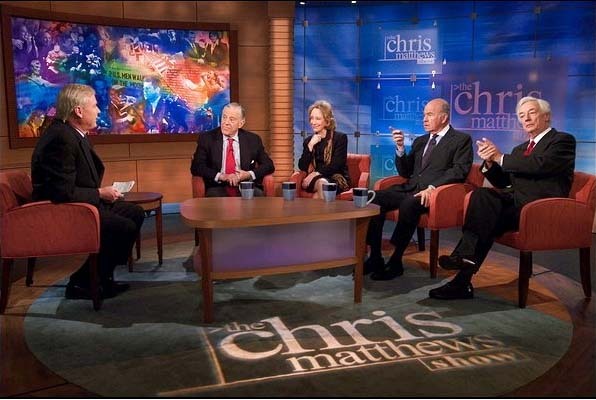 Rather than interrogating politicians in "a way that forces people off their talking points," as Matthews puts it, he shoots the breeze with fellow journalists and commentators -- a rotating group of about two dozen that includes Gloria Borger, Cokie Roberts, David Brooks, Sam Donaldson, Joe Klein, Peggy Noonan and Clarence Page. Matthews gives the guests a bit of space instead of browbeating them into agreeing or disagreeing with his tidal wave of opinions. "My job is to be much more like Ed Sullivan, to simply introduce them and make sure the exchanges are lively," says Matthews, who tapes the show on Friday afternoons. "It's not gladiatorial." Newsweek's Howard Fineman, who appears on both programs, says Nathan convinced Matthews that "there was something between 110 miles an hour on 'Hardball' and PBS. He doesn't shout, he doesn't lean in, he doesn't look like he's looming over his prey." CNN's Tucker Carlson, another regular, says: "There is this stream-of-consciousness quality to the way he speaks, but he actually says things that are interesting and unusual. . . . I know it's fashionable to beat up on Chris as a blowhard, and he's got some blowhard qualities, but I like the guy." On "Hardball," Matthews is doing a series of hour-long interviews with eight of the nine Democratic presidential candidates. The exception: Rep. Dennis Kucinich, who's still fuming over an appearance in July. After Kucinich had announced he would nominate a gay, bisexual or transgendered person to the Supreme Court if that person would uphold Roe v. Wade, Matthews said: "It just looks like the most patent kind of pandering." When Kucinich said he was against criminalizing abortion, Matthews pressed him eight times to name someone who was in favor of it, and when Kucinich named a GOP House member, Matthews said: "I think it's a rotten thing to say." Kucinich spokesman David Swanson says Matthews "harassed" and "badgered" his boss and "made pretty wild accusations and did not allow the congressman to reply and treated him extremely rudely." Kucinich says only that "I'm not interested in saying anything to disparage him, I just don't want to be on his show." Matthews, a onetime aide to Jimmy Carter and Tip O'Neill, isn't sure why "Hardball" ratings -- the program is averaging 379,000 viewers -- are down by about two-thirds from their late-1990s peak. He floats one theory: A heavily conservative cable audience, which liked his Clinton-bashing during impeachment, has been turned off by his opposition to the Iraq war. He says the Bush administration's handling of the war was "the great tragedy of the last year" and has put the United States in a "horrible situation." Most administration officials avoid "Hardball," and some are fuming over his recent remarks at Brown University, for example, that Vice President Cheney "is running the place" and "put his thumb on the scale" to force conservative decisions. But things are lighter on the Sunday show. Nathan notes a joking comment to Matthews by Don Imus that each program has "a babe and a nut." "Yes, true, we have babes," she laughs. "We specialize in great-looking women." "I do a commentary at the end which I think is pretty good." During the California recall, "I thought I did a great job out there." "What people like about me is I'm honest." "You walk down Fifth Avenue, people come up and say they love me." Matthews may soon be inescapable. He is on Washington bus placards, is spoofed as "Chris Cashew" in Jerry's Subs commercials and -- d'oh! -- will play himself on "The Simpsons." Chris, I met you in Boston when you were hawking your book, "America, Beyond our Wildest Dreams." one that is affectionately called, "Rummy". I don't know Chris but I think the 7 year anniversary has gone to your head or made it soft, because to me you were certainly soft on him,(or respecting his position too much and not honoring your own)come on, you can't tell me that those guys all didn't meet together and decide whether or not to go to war or not, the only thing that I heard from Mr.Rumsfeld was that he was protecting his own little hide and distance from the President, so that when Mr. Bush looses the election he can say it wasn't my fault, I didn't tell him to go to war. I mean come on, lets not put all the blame on Colin Powell. Come on Chris you just accepted his answer when you tried to come back at him or I think you appeased him. When you were in Boston that day Chris you were against the war, you said that the United States tradionally never gets into combat, unless it was principally to defend a wrong, never to initate or perpetrate, without a just cause. I don't know something like this I don't know the exact way you put it after all I'm just a woman plu the fact that I grew up in Worcester. Ha!Ha! DAryl Hammond was even harder than you last night and so was Mr. Marr, after all he's right we don't have to like John Kerry to vote for him we just have to agree with his policies and know where he's coming from. Mr. Bush's invasion of Iraq had to do with a very personal matter, and I hope that I don't get in trouble saying it. So heres my email, you said you like getting them and to keep them coming. Chris Matthews disappoints me. He has been behaving like a homophobe in his discussions with Imus, and has been comparing anti-war people to Bin Laden. I feel like he will say anything to pander to right-wingers, just so they will watch his show.